General of the Armies John Joseph "Black Jack" Pershing (September 13, 1860 – July 15, 1948), was a general officer in the United States Army. 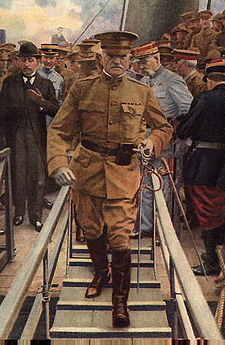 He led the American Expeditionary Forces in World War I. Pershing is the only person to be promoted in his own lifetime to the highest rank ever held in the United States Army. The rank is known as General of the Armies. (a retroactive Congressional edict passed in 1976 promoted George Washington to the same rank but with higher seniority). Pershing holds the first United States officer service number (O-1). He was regarded as a mentor by the generation of American generals who led the United States Army in Europe during World War II. These include George C. Marshall, Dwight D. Eisenhower, Omar N. Bradley, and George S. Patton. As there was no prescribed insignia for this rank, General Pershing chose the four stars of a full general, except in gold. The rank has been argued to be equivalent to "6-star" general, as the insignia of the next lowest rank "General of the Army" is designated by five stars. According to the biography Until the Last Trumpet Sounds by Gene Smith, Pershing never wore the rank on his uniform. 1925: Chief Commissioner assigned by the United States in the arbitration case for the provinces of Tacna and Arica between Peru and Chile. ↑ "Library of Congress link: Washington held the title of "General and Commander in Chief" of the Continental Army". Wikimedia Commons has media related to John J. Pershing.